Roger Ballenger was born in 1934 in Columbus, Ohio. He enlisted in the U.S. Army on September 10, 1952, and after completing basic training, advanced individual training, and airborne training, he served with the 307th Airborne Engineer Battalion at Fort Bragg, North Carolina, from September to December 1953, and then with the 187th Regimental Combat Team in Japan from December 1953 to July 1955. 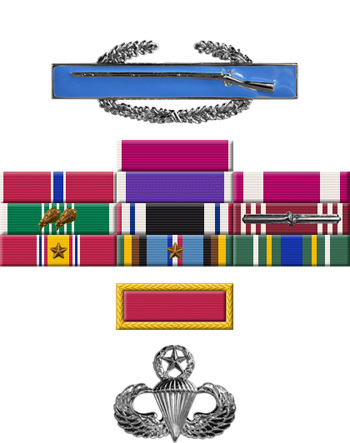 He served in South Korea from August 1956 to December 1957. 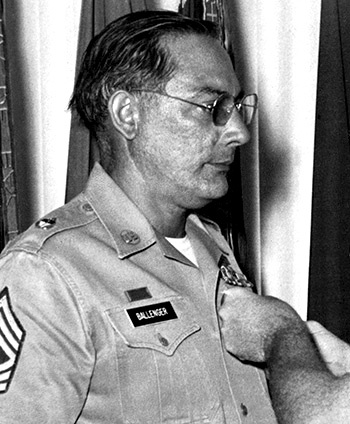 Sgt Ballenger served with Company A, 326th Engineer Battalion at Fort Cambell, Kentucky, from December 1957 to November 1959, followed by service as a Demolitions Specialist with the 77th and then the 7th Special Forces Group at Fort Bragg, North Carolina, and deployed to Laos from November 1959 until he was captured and taken as a Prisoner of War on April 22, 1961. After spending 481 days in captivity, he was released by his captors on August 15, 1962. SSG Ballenger was briefly hospitalized to recover from his injuries at Fort Bragg, and then served as a Demolitions Supervisor with the 7th Special Forces Group, and then as a Demolitions Instructor with the Special Forces Training Group, at Fort Bragg from October 1962 to May 1964. His next assignment was as an Operations and Intelligence Sergeant with Company B, 6th Special Forces Group at Fort Bragg from May 1964 to January 1967, and then with Company C, 1st Special Forces Group in Okinawa from January to March 1967. SFC Ballenger served as an Operations Sergeant with the U.S. Army Special Warfare School at Fort Bragg from May to October 1967, followed by service as an Intelligence Sergeant with the 92nd Psychological Operations Company at Fort Bragg from November 1967 to May 1968. He then served as an Intelligence Sergeant with the 7th Psychological Operations Group in South Korea from May 1968 to June 1969, before serving as an Intelligence Sergeant with the 24th Psychological Operations Detachment on Okinawa from June 1969 to December 1971. MSG Ballenger next served as an Intelligence Sergeant with the U.S. Army Element, I Corps, with U.S. Forces Korea in South Korea from December 1971 to January 1973. His final assignment was as an Operations Sergeant with the 4th Psychological Operations Group at Fort Bragg from February 1973 until his retirement from the Army on September 1, 1973.